Beat the Clock: Can Russia Fix its Crippled Mars Probe in Time? 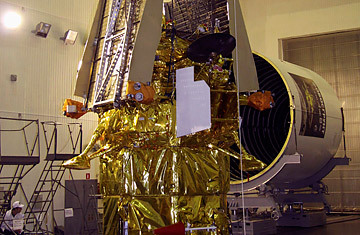 The Phobos-Grunt (Phobos-Soil) spacecraft is prepared for its mission at the Baikonur comosdrome in Kazakhstan October 31, 2011. Mars and Russia have never gotten along. The Red Planet has been eating Russian spacecraft since 1960, when the then-USSR made its first attempt to launch a Mars-bound ship and never even got it off the pad. Since then, there have been 17 more missions  and 17 more failures or only partial successes. Now add an 18th. On Nov. 8, a $163 million, 14.6 ton (13.2 metric ton) spacecraft designed to collect and return a sample from Mars's potato-shaped moon Phobos got no farther than Earth orbit, when two engines intended to boost it up and away onto its trans-Mars trajectory failed. Russian engineers now have just three days to figure out the problem before the ship's batteries die, turning it into a huge and, thanks to its massive load of fuel, highly toxic mass of space junk. "It has been a rough night for us," Vladimir Popovkin, the Russian space czar, told Russian new agency RIA Novosti. "We will attempt to reboot the program. The spacecraft is currently on a support orbit, the fuel tanks have not been jettisoned and the fuel has not been spent." There is no shame in having a hard time getting to Mars, as the U.S. itself could attest. The distance between the two planets varies from as little as 33 million miles (54 million km) to as much as 250 million mi. (400 km), depending on where they are in their respective orbits. It takes at least seven months to travel even the shortest route and once a spacecraft arrives, it takes from 3 to 22 minutes for a radio command moving at light speed to travel one way  and another 3 to 22 to travel back. Little wonder that about half of all Mars missions from all countries have come to grief, with the U.S. suffering its most recent failures in 1992, 1998 and 1999. But NASA also has a five-mission winning streak going, with two orbiters, two rovers and one stationary lander arriving successfully and performing brilliantly since 2001. On Nov. 25, NASA is planning its most ambitious mission yet, launching the 10-ft. (3 m) long, car-sized Curiosity rover on a mission to Mars's ancient Gale crater. Grand as that mission may turn out to be, Russia was trying something entirely new. A sample return mission has been on NASA's to-do list for a long time, and there it currently remains, with tentative plans for a joint NASA-European effort in, perhaps, 2017, funding and political will permitting. Russia, which hasn't looked Marsward since its last failure in 1996, was proposing to vault over us, aiming to land on and collect a scoop of the 13 mi. (22 km) Phobos, the larger of Mars's two moons. If all still does go according to plan, that touchdown will take place in 2013 and the 7 oz. (200 gm) sample will be returned to Earth in 2014. The makeup of the soil could help determine Phobos's origins  whether it is an asteroid captured by Mars or a bit of rubble that broke away from the planet  as well as provide new clues to the geology of the ancient solar system. The mission as a whole could also give the Russian space program a bit of its old mojo. But even landing on so small a body  with so faint a whisper of gravity  and bringing home so lightweight a sample can be very fuel intensive. Fourteen of the ship's 14.6 tons are fuel  a nasty mix of nitrogen tetroxide and hydrazine. Burning that up in space would not pose any danger. But parking it just overhead in an unstable Earth orbit could spell real trouble. As space consultant and NASA vet James Oberg told the AP, "[The fuel], which could freeze before ultimately reentering, could make it the most toxic falling satellite ever." All hope for the ship is not lost. Smart engineers can do a lot in three days, and if the problem with the engines is just a software glitch, a fix may be relatively straightforward. "Depending on the actual root of the failure," Oberg said, "this is not an impossible challenge." If the fix does fail, then the wait will be on to determine when and where the spacecraft makes its eventual death plunge. Dry land is still a relative long-shot, if only because 70% of the Earth's surface is water. But that did little to help the Australian outback, which got clobbered by NASA's incoming Skylab in 1979. Mars, as always, is proving to be a very hard mistress. Give Russia props for trying  even if they, like most, have such a hard time succeeding. See photos of the patterns of Mars. See photos of what the Mars Phoenix Lander saw.